Rise in anti-Semitic attacks during National Hate Crime Awareness Week Genocide is everywhere and always preceded by a surge of hate speech directed at religious or ethnic minorities. In Rwanda, Tutsi were called ‘cockroaches’ in order to dehumanise them and to justify their mass murder. This relationship suggests we should be wary of how similar language may enter our everyday discourse. Nobody can suggest that Britain is at risk of genocide, but taking a stand when racism rears its head at home is the first step to creating a resilient and cohesive society. As recently as 2015, popular columnist Katie Hopkins wrote in a national paper that “these migrants are like Cockroaches” - and we should be worried that a nation which facilitates this behaviour will not fulfil its moral obligation either to its own citizens nor to the oppressed peoples of the world. Hopkins’ column was not an isolated incident. In recent years, hate crimes and racist speech have become a fact of life for many minorities in Britain. 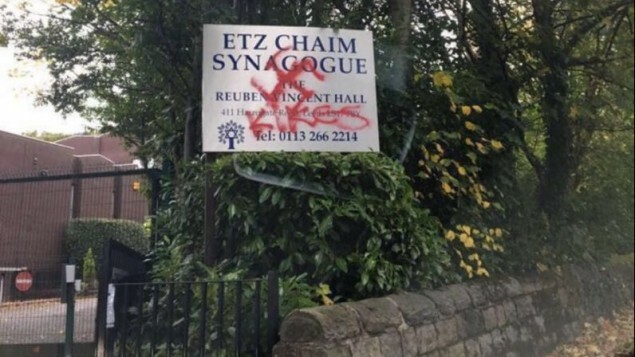 The Jewish community in Leeds, which was rocked by anti-Semitic graffiti early this October, is just the most recent example of this problem. On the morning of the 11th October, daubed across the walls of a synagogue on a main road, the word ‘kikes’ was visible to all. A rabbi’s daughter observes that ‘few seem to be truly talking about it’. The vandalism appeared shortly after Rosh Hashanah, the Jewish new year celebration, perhaps a calculated attack engineered to demoralise the Jewish community by sullying a special occasion. Attacks of this nature are far from exceptional. National Hate Crime Awareness Week, which ran last week from the 14th to the 21st of October, saw police hunting two men who put up Nazi propaganda next to Britain’s oldest synagogue. Earlier this year, one of Cambridge University’s libraries was vandalised with leaflets denouncing widely accepted facts about the nature and scale of the Holocaust. It should be astounding that more than 70 years after the end of the Holocaust, anti-Semitism seems prevalent in British society, but the idea of racist views as legitimate discourse has made its way into popular British politics and is unfortunately a feature of both major parties. This follows some worrying trends over the past year, with hate crimes soaring in the wake of deadly terror attacks. Freedom of Information figures have revealed since the EU referendum race and faith attacks reported across the UK are at an all time high. Incidents reported in the past year include a Muslim woman being dragged along the pavement by her hijab, and two Polish men being attacked in the street, resulting in one death. The increase in recorded Islamophobic incidents after the London Bridge attacks in June is greater than it was after the 2013 murder of Lee Rigby and after the 2015 massacre in Paris, two different sets of figures have suggested. In the wake of the EU referendum, hate crimes against eastern Europeans and visible ethnic minorities increased, and after attacks in Manchester and London, hate crimes have been directed against those perceived to be Muslim, numerically a smaller group than those targeted last summer. Reports of anti-Semitic incidents hit record levels in the first six months of 2017. The Community Security Trust (CST) said 767 reports were made to them between January and June - a rise of 30% on the same period last year. A total of 80 incidents involved physical attacks - up from 45 in 2016. There were also 12 cases of mass-mailed anti-Semitic leaflets or emails. Unless we act to educate and dispel hatred now, what happened in Leeds will happen again and again with increasing frequency. If we are serious about ending genocide, the battle must start here at home. In a time of mass atrocities and horrific events unravelling nations across the world, we must not be complacent about the issues facing our most immediate neighbours. We must show solidarity with those around us who feel vulnerable and stay vigilant in the face of any intolerance we encounter. Only a people which protects the most vulnerable at home can be relied upon to do so abroad, and the British people have a responsibility to do so as a moral leader of the free world. The first step on this road is education, and the Aegis Trust is dedicated to this goal. To learn more about Aegis’ work, follow this link. If you are a student, you can join or start a society of STAND UK in your community and join the fight to end and prevent genocide worldwide. Victims and those feeling vulnerable should report any incident of hate crime to the police on 101, or using the True Vision website (www.report-it.org.uk). In an emergency, always dial 999. This post was written by Daisy Goodall who studies at the University of Bristol and is STAND UK's student director.